Each year, I love talking about Dr. Martin Luther King Jr and all that he stood up for. This is a great opportunity to discuss with students citizenship and character. With the rise of bullying (especially cyber) I like to also plug in the alternative that MLK used instead of hatred and violence. Then I gather the students around the easel so I can read them the book, Martin’s Big Words by Doreen Rappaport. I love this book because of the captivating artwork and that it reads like it’s fiction. It outlines the historical events of Dr. Martin Luther King Jr pursuit of equality while laying out his vision for America. Since the title is Martin’s Big Words- we discuss literal vs figurative language. 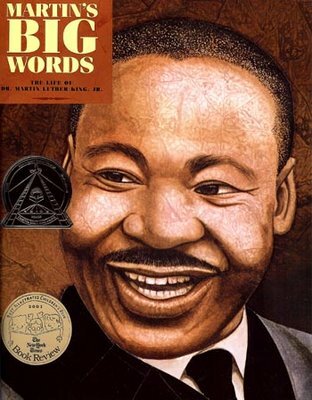 The words of MLK was not literally “big words” or long words but rather powerful words that rang out like music and caused people to stop and listen. I remember the first time I heard MLK speak his “I have a dream…” speech (on tape of course). It moved me. It stirred things up inside me and created goosebumps! After reading the text, we then return to our sheet to write the meaning of these words after reading the text. We again discuss these. 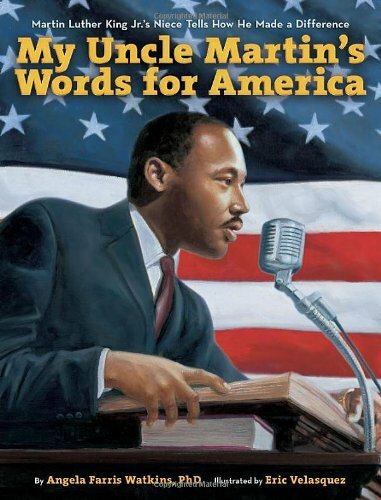 Later I read the book My Uncle Martin’s Words for America by MLK’s niece, Angela Farris Watkins. It’s a very interesting reading about Martin Luther King Jr from the point of view of his niece. It too focuses on the major events that MLK was so passionate about and the powerful words listed above. After reading this story, we compare and contrast the two books together first in groups and then share out creating one large Venn diagram on chart paper. After this, we discuss the major events and complete a timeline created through the use of matchbook folds. See the picture below. Of course, you can have students write it in themselves or just cut and paste it in. 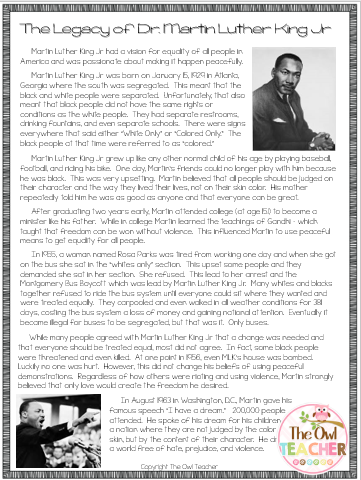 Next, we discuss the important events (though the timeline was not a complete list of all his accomplishments and historic activities), we then partner up and I have students read a piece I wrote about Martin Luther King Jr. (This piece could be read ahead of the timeline assignment and used as a reference for it, if desired.) 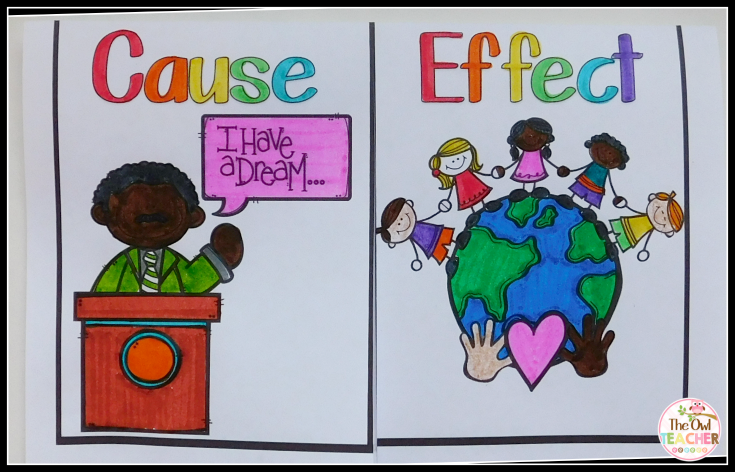 Then from that piece, they complete this cause and effect activity (because we ALWAYS need extra practice with cause and effect). After this, I provide students the opportunity to see Martin Luther King Jr in action. We watch this 5-minute clip so students can get an idea of just how powerful his voice was. There are a lot of activities above, so feel free to pick and choose or even modify them to your liking and class’s needs! All of these activities above are FREE to download at my TpT store. 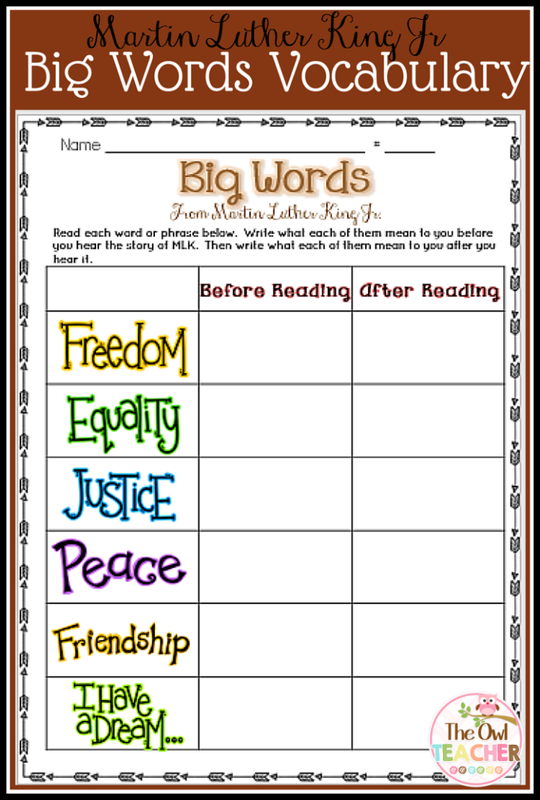 I even added some writing pieces (not mentioned above) for your students to complete. Check it out by clicking here. Of course, there is definitely more than can be taught using the above resources – such as character traits, author’s purpose, theme, main idea, sequencing, and diversity. Here’s to the love inspired by Dr. King. Beautiful lesson ideas here! You never know which word and its meaning each student will take into their own future. This post is perfect timing for the upcoming holiday! I love Martin's Big Words & will have to check out the book by his niece. Thanks for the great ideas! 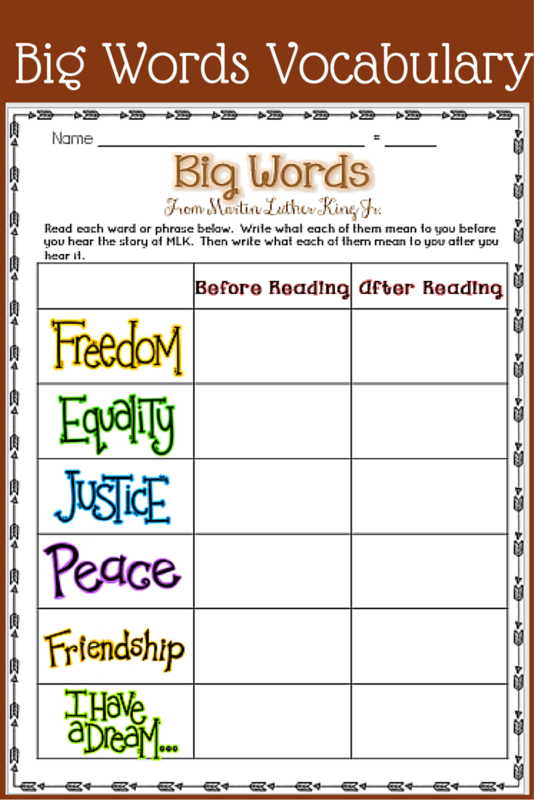 Sounds like a great lesson on character and Martin Luther King Jr.
Great post about such valuable resources and learning adventures for your students. Great post! Thanks for sharing your ideas and providing a freebie as well!